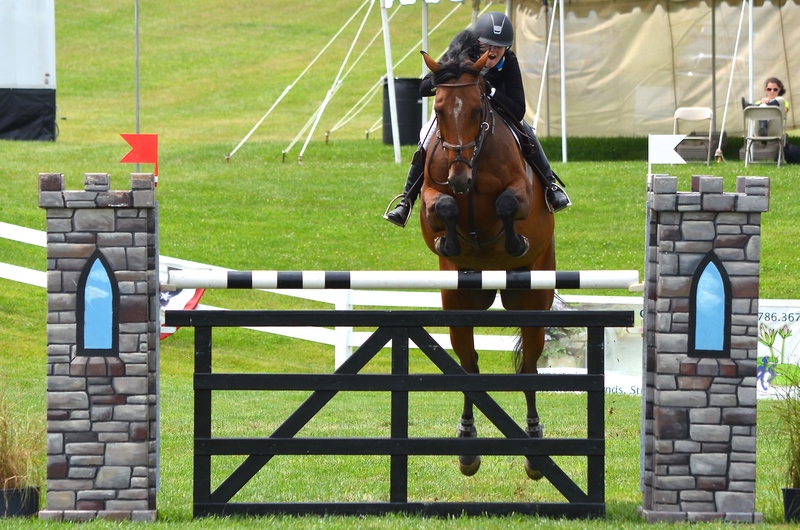 Zionsville, IL – August 11, 2014 – The $75,000 Grand Prix of Indianapolis at the Traders Point Hunt Charity Horse Show managed by Stadium Jumping Inc., was another exciting class held on the beautiful grass field of Mrs. Sylvester Johnson’s Wild Air Farm in Zionsville, IN. Excellent weather all week made for great footing for the feature class with twenty-five horse and rider combinations vying for the coveted prize and the victory gallop. The Philip J. DeVita designed course began with a 1.50m high and 1.45m wide oxer as jump number one, followed by 4A and 4B which was a very scopey vertical, vertical combination. 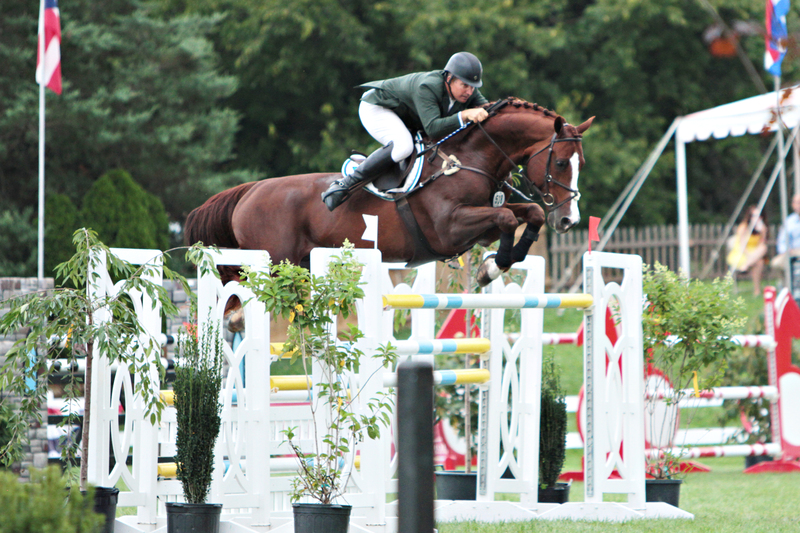 Another challenge was the combination set at the bottom of the famous Traders Point hill, which took its toll on a number of exhibitors, then finishing with the open water and six strides to a 1.50m vertical. It was lucky thirteen in the order of go for Amateur Owner rider Caitlin Hope, 22, of Barrington Hills, IL, and Total Touch, who were the first clean round of the day, which wouldn’t be matched until several horses later when Aaron Vale went clean on Spirit of Alena. Hope accomplished a similar feat the week before in the $25,000 Hagyard Grand Prix in Kentucky with the only clear round in the first 25 horses, finishing seventh with a double clear effort out of 51 entries. Caitlin Hope and Total Touch in the jump-off. Photo by Kate Morgenstern Lopez. Tracy Fenney of Flower Mound, TX, and MTM Timon, were the third pair to make the jump-off list. David Beisel of Goshen, OH and Ammeretto were close, incurring only two time faults. Hope returned first for the jump-off setting the pace at 44.811 with a clean round. Vale was able to clip seconds off that time for the win with a clean round and a time of 41.582. Fenney had an unfortunate rail at the first jump giving her the third place spot. Aaron Vale and Spirit of Alena earned the win and the victory gallop. Photo by Kate Morgenstern Lopez. Hope seems to get it done without having multiple rides to accomplish the task. Total Touch, owned by Kathleen Hope, is her only Grand Prix ride but the team has been together for five years now and they are a match made in heaven. 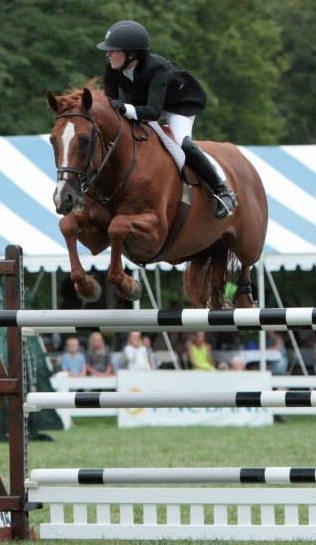 Hope and Total Touch in the $25,000 Hagyard Challenge Grand Prix in Kentucky. Photo by Rebecca Walton/PhelpsSports. “We went 13th in the order and also 13th in the order in the $25,000 Hagyard Challenge Grand Prix in Kentucky last week so Diane said before we went yesterday that 13 is our lucky number!” smiled Hope. Caitlin Hope and Vision EH. Photo by Chicago Equestrian. The Amateur rider has had a great year with Total Touch, winning the $30,000 Grand Prix of St. Louis in March and second in the Welcome Stake there. She placed second in the Spring Spectacular II Welcome Stake in June and was second in the $10,000 High Jr/AO Classic as well. Hope also rides a younger horse she is bringing along with Carney and is owned by Kathleen Hope, Vision EH. The pair finished third with a double clear effort in the SJHOF class earlier in the day at Traders Point. Hope has been riding with Diane Carney of Antioch, IL, since the small pony division and her Champion pony, Stocking Stuffer. As a junior, Hope added numerous titles to her resume including USET Gold Medal Winner, Best Child Rider at Devon, Harrisburg and Ocala and Junior Hunter Champion on Lyle at Capital Challenge, Harrisburg and Washington just to name a few. Hope was also one of the ten riders selected for the George Morris Gladstone Program at Annali-Brookwood Farm this past June. 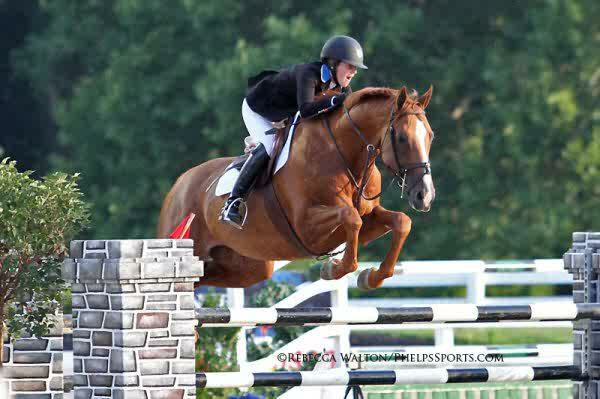 She has ridden in the November George Morris Chicago clinic, which Carney organizes, for more than eight years as well. Hope is finishing college at Lafayette College in Easton, PA, but will meet up with Carney for the indoor championship horse shows. 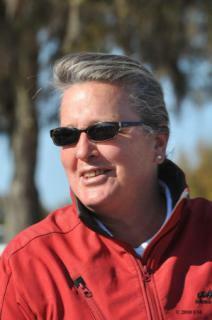 Carney is a USEF R judge in HU/EQ/JP and teaches and organizes clinics across the country. For more information contact Diane Carney at 847-922-6167 or dtelluride@aol.com.